Can we rescue great photojournalism? Photojournalists are yesterday’s heroes. True, there are still some big names out there, among them Gilles Peress and Sabastiao Salgado. But the significance of their work is unclear. Do they shape political or social opinion through their images? Or are they mostly regarded as imaginative artists who just happen to be drawn to tough, newsworthy subjects? Few photographers are any longer seen as providing definitive information about some national or international trouble spot, at least very few who are what used to be called professionals. The news magazines, which turned certain photojournalists into superstars, have been fading for decades, and the newspapers are in dire health. The proliferation of amateur photographs and videos on the internet has swamped whatever sense there was of photojournalists and their editors as gatekeepers, providing some judgment and oversight. The whole idea that photography has some particular purchase on the truth has been called into question in places high and low, from the writings of Susan Sontag to the rants on cable TV. Definitive is itself nearly a defunct concept. True enough, photojournalism has always been met with a certain degree of skepticism. A half century ago, there were intellectuals who quite rightly saw the world as represented in Life and Look as in many respects a fiction, and it has long been understood that photography has a propagandistic power, whether for left, right, or center. But, by now, the skepticism about photojournalism has become so pervasive that some counterbalance is needed, and so, I have been glad to see new work on the subject by Susie Linfield, who writes on cultural matters, and Peter Galassi, the curator of photography at the Museum of Modern Art. Neither Linfield nor Galassi has any interest in the old romantic view of the photojournalist as a prophetic voice. In a sense, their essential point is relatively modest, for what they are saying is that photojournalists, while not necessarily truth tellers, are not necessarily liars, either. In his long introduction to the catalogue of the Henri Cartier-Bresson that he organized last year at the Museum of Modern Art—it is currently in San Francisco and travels to Atlanta—Galassi has produced a seminal account of a great photographer who was both a photojournalist and a self-conscious artist, who balanced truth-telling and poetic imaginative play. Linfield’s new book—The Cruel Radiance: Photography and Political Violence (University of Chicago Press)—is a beautifully considered and unabashedly impassioned plea for the continuing moral relevance of photojournalism. 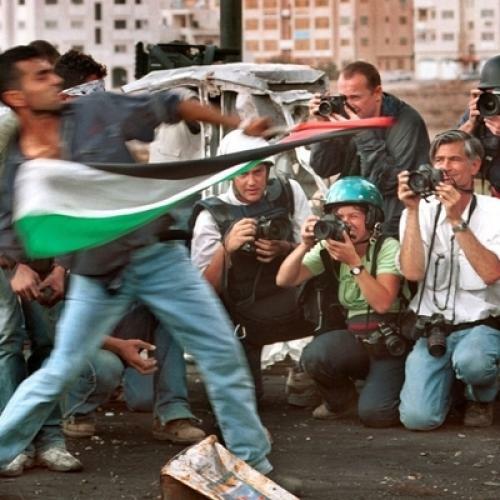 Writing in direct response to ever-increasing doubts about the truthfulness and ethical significance of photojournalism, Linfield offers a defense of photojournalism that honors the photographers without turning them into saints or their work into sacred icons. On the subject of photojournalism, both Galassi and Linfield might be said to be disabused optimists. “The earliest photojournalists,” Linfield observes in The Cruel Radiance, “expected images of injustice to push viewers into action; photographs were regarded not as expressions of alienation but as interventions in the world.” That optimism, she is perfectly aware, is no longer sustainable. But she argues that our skepticism should not become “an argument for not looking, not seeing, or not knowing, nor for throwing up one’s hands or shielding one’s eyes.” Linfield will not shy away from difficult pictures. She discusses photographs from the Civil War in Sierra Leone, of men, women, and children with amputated limbs, victims of deliberate mutilation, sometimes by child soldiers. The question that Linfield asks is what good it does to look at such photographs. Are we merely, as some critics have argued, indulging in our own privileged (i.e., safe) position, becoming voyeurs? What can such photographs tell us? And what can we do with this knowledge? In the case of one photograph from Sierra Leone that Linfield focuses on, of a mutilated girl, Memuna Mansarah, our sense of the violation of a child’s innocence, our sense of the ghastly mutilation as pure evil, is complicated by our awareness that some of the assailants were children, too. Linfield considers photographs of the child soldiers as well. She is quite certain that no photograph, in and of itself, can tell us all we need to know. But she insists on photographs as essential pieces of evidence, as part of the story we must have. Naturally, when we look at a photograph, we should consider other factors as well. We will want to read news reports and histories in order to better understand a conflict. And we will want to bring into play a whole range of moral considerations. A photograph may not tell us enough, but it can help us understand something about the unfathomable cruelty of the world—and perhaps even help us see how we can act or support action in the world. In a trio of chapters devoted to major photojournalists—Robert Capa, James Nachtwey, and Gilles Peress—Linfield argues, I think quite effectively, that a photographer’s distinctive viewpoint does not necessarily endanger the credibility of the work that he does. The choices the photographer makes—as to how to crop or juxtapose photographs, as to how much narrative to include in a book, and so forth—quite naturally reflect a worldview. As viewers, we are aware of this, and we proceed to make judgments both about what we are seeing in the photographs and how we believe that what we are seeing has been shaped by the photographer. Linfield writes that Peress’s book Telex Iran—with pictures “printed in a large, unconventional page size” and made to feel “jumbled and strange”—“may be the closest we’ll ever get to how the witnessing of a violent political event actually feels.” Robert Capa’s photographs, taken more than half a century ago, are the work of an unabashed idealist, and we understand when Capa photographs the Spanish Civil War that he wants to show “rare kinds of commitment and ideals of fraternity,” a particular “peculiar combination of pain and possibility.” Neither Peress’s Iran nor Capa’s Spain gives us the whole truth about a time and a place. But that does not mean their photographs are a pack of lies, either. In Linfield’s thinking, we are free to judge, to evaluate, to bring to the photograph everything else we know or can discover about the situation. Among the great figures who appear only fleetingly in Lindfield’s pages is Cartier-Bresson, a founder of the photojournalists’ organization Magnum, which has counted among its members some of the photographers who interest Linfield the most. Cartier-Bresson surely witnessed some of the ultimate trouble spots in his time; he was with Gandhi in 1948 shortly before he was assassinated and photographed his funeral, and, the next year, he was in China, witnessing the closing chapters of the Civil War. Cartier-Bresson was 95 when he died in 2004, and Peter Galassi has used this retrospective—”Henri Cartier-Bresson: The Modern Century” —as an opportunity to finally grapple with the vast range of his work. Cartier-Bresson’s achievement, embraces exquisitely enigmatic images from the 1930s, innumerable photojournalistic assignments, and two elegantly produced albums—The Decisive Moment and The Europeans—that more or less defined photography as an imaginative art in the mid-century years. Galassi sees Cartier-Bresson’s work after World War II as “sprawling and imperfect.” He says that “its panoramic scope, its lusty curiosity, its acute responsiveness to the full panoply of human experience—and its many masterpieces of photographic art—constitute a uniquely full and nourishing account of the emergence of the modern world.” Galassi’s long catalogue essay is the best writing that this curator has ever done—and it is probably the finest discussion of Cartier-Bresson’s work ever produced. Galassi navigates the variegated sides of Cartier-Bresson’s career with a winning combination of critical particularity and intellectual freedom. He respects the integrity of the photographs. But he also thinks they demand our discrimination, our judgment. Which images are “mere” journalism? Which are pure poetry? And what of the ones that are combinations of the two? Cartier-Bresson’s lyricism—the serendipity of his compositions, the open-endedness of his metaphors—demands not only our artistic but also our intellectual and our moral engagement. In Galassi’s essay, Cartier-Bresson emerges as the engaged aesthete. Peter Galassi believes that Cartier-Bresson’s “unresolved but vigorous involvement with the craft of photojournalism immeasurably enriched his work.” Perhaps the larger point is that photojournalism, because it is subject to so many conflicting pressures, becomes a test case for photography’s vexed relationship with the wide world. Susie Linfield deals with some of the most challenging products of the photojournalist’s craft, the pictures that are so frightening or horrific as to tempt us to avert our eyes. She considers such photographs as a form of knowledge and even as a call to action. And she does not deny that their political power is in some instances related to their poetic power. Perhaps anybody who is willing to succumb to the power of images is in some sense a romantic. If that is the case, then both Galassi and Linfield, in contemplating photojournalism, emerge as levelheaded romantics. They are determined to rescue the power of photography from the scourge of photographic sensationalism.